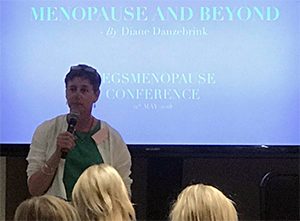 I was one of a group of expert speakers at “MegsMenopause conference“, described as “a day of taboo-busting, open conversation and the latest in scientific research on the menopause” in London earlier this week. Event organiser and an icon of the nineties Brit Pop scene, Meg Mathews was married to Noel Gallagher of Oasis and is a former music industry PR, events planner and designer turned entrepreneur and advocate for the menopause. I was invited to speak about menopause as a time of transition and transformation and it was so interesting to see so many nods of recognition from women in the audience when I spoke about the need for time alone for reflection. Supported by Women’s Health Concern and The Daisy Network, Meg and her guest speakers aimed to break the stigma of the menopause by empowering women with the knowledge and confidence to take on this time of their lives. Guest speakers and experts also included: specialist menopause nurse and chair of the British Menopause Society Kathy Abernethy, founder of Menopause Matters Dr Heather Currie, nutritional expert Dr Marilyn Glenville and renowned gynaecologist Dr Sara Matthews. Topics discussed include: ‘What is HRT’, ‘Menopause in your teens, 20s and 30s’, Myths and facts of complementary therapies, the impact of your daily choices on your hormonal system, and ‘Menopause in the workplace and in the media’.